Family, Friends Honor Prince In 'Loving Goodbye' At Paisley Park Estate : The Two-Way Scores of fans turned out for a makeshift memorial at the music superstar's Minnesota estate on Saturday, while family members held a private ceremony after his remains were cremated. Scores of fans visited Prince's Paisley Park compound in Chanhassen, Minn., on Saturday afternoon. The fence has rapidly become a makeshift memorial celebrating the life of the artist. Since the news of Prince's death broke on Thursday, fans have been flocking to the late artist's Paisley Park estate in Minnesota to celebrate his life. 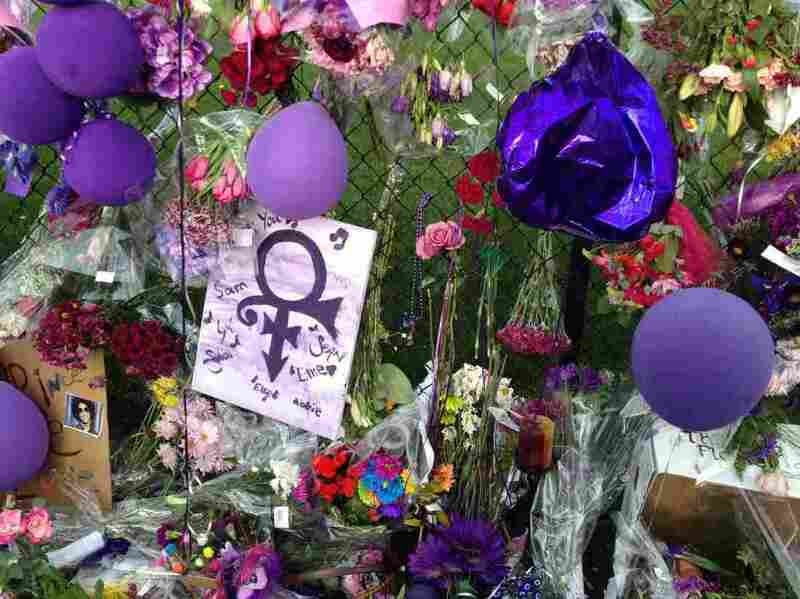 Hundreds of fans, many of whom wore purple, showered the security fence surrounding the property with cards, flowers, stuffed animals and purple balloons, over the weekend to pay tribute to The Purple One. Prince fans adorned the fence of his Paisley Park estate with purple balloons, flowers and handwritten testimonials over the weekend. On Saturday afternoon, Prince's family members were seen among the mourners at the makeshift memorial, reporter Nancy Rosenbaum tells NPR, including Prince's brother-in-law, Maurice Phillips, who greeted visitors. Rosenbaum spoke with an emotional Susan Unger, one of many people who tied a handwritten note to the fence. "I said, Prince, you'll be missed. I respect you so much for your gift, your grace, your spirituality," Unger told Rosenbaum. "I never bought an album but I'm coming here because of the loss of him and his music." In the early evening, the 57-year-old music superstar's family and friends gathered "in a private, beautiful ceremony to say a loving goodbye," Prince's publicist Yvette Noel-Schure said in a statement. "Prince's remains have been cremated and their final storage will remain private. We ask for your blessings and prayers of comfort for his family and close friends at this time. The cause of death remains unknown and it will be at least four weeks before we receive the results of the autopsy. An announcement will be made at a future date for a musical celebration."